invasion and multiplication of microorganisms in body tissues, as in an infectious disease. The infectious process is similar to a circular chain with each link representing one of the factors involved in the process. An infectious disease occurs only if each link is present and in proper sequence. 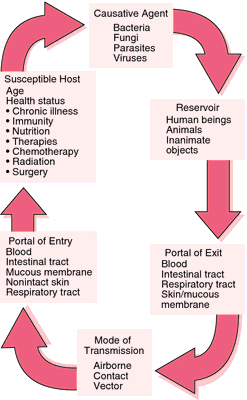 These links are (1) the causative agent, which must be of sufficient number and virulence to destroy normal tissue; (2) reservoirs in which the organism can thrive and reproduce; for example, body tissues and the wastes of humans, animals, and insects, and contaminated food and water; (3) a portal through which the pathogen can leave the host, such as the respiratory tract or intestinal tract; (4) a mode of transfer, such as the hands, air currents, vectors, fomites, or other means by which the pathogens can be moved from one place or person to another; and (5) a portal of entry through which the pathogens can enter the body of (6) a susceptible host. Open wounds and the respiratory, intestinal, and reproductive tracts are examples of portals of entry. The host must be susceptible to the disease, not having any immunity to it, or lacking adequate resistance to overcome the invasion by the pathogens. The body responds to the invasion of causative organisms by the formation of antibodies and by a series of physiologic changes known as inflammation. The spectrum of infectious agents changes with the passage of time and the introduction of drugs and chemicals designed to destroy them. The advent of antibiotics and the resultant development of resistant strains of bacteria have introduced new types of pathogens little known or not previously thought to be significantly dangerous to man. A few decades ago, gram-positive organisms were the most common infectious agents. Today the gram-negative microorganisms, and Proteus, Pseudomonas, and Serratia are particularly troublesome, especially in the development of hospital-acquired infections. It is predicted that in future decades other lesser known pathogens and new strains of bacteria and viruses will emerge as common causes of infections. The development of resistant strains of pathogens can be limited by the judicious use of antibiotics. This requires culturing and sensitivity testing for a specific antibiotic to which the identified causative organism has been found to be sensitive. If the patient has been receiving a broad-spectrum antibiotic prior to culture and sensitivity testing, this should be discontinued as soon as the specific antibiotic for the organism has been found. It would be helpful, too, if the general public understood that antibiotics are not cure-alls and that there is danger in using them indiscriminately. In some instances an antibiotic can upset the normal flora of the body, thus compromising the body's natural resistance and making it more susceptible to a second infection (superinfection) by a microorganism resistant to the antibiotic. Although antibacterials have greatly reduced mortality and morbidity rates for many infectious diseases, the ultimate outcome of an infectious process depends on the effectiveness of the host's immune responses. The antibacterial drugs provide a holding action, keeping the growth and reproduction of the infectious agent in check until the interaction between the organism and the immune bodies of the host can subdue the invaders. Intracellular infectious agents include viruses, mycobacteria, Brucella, Salmonella, and many others. Infections of this type are overcome primarily by T lymphocytes and their products, which are the components of cell-mediated immunity. Extracellular infectious agents live outside the cell; these include species of Streptococcus and Haemophilus. These microorganisms have a carbohydrate capsule that acts as an antigen to stimulate the production of antibody, an essential component of humoral immunity. Infection may be transmitted by direct contact, indirect contact, or vectors. Direct contact may be with body excreta such as urine, feces, or mucus, or with drainage from an open sore, ulcer, or wound. Indirect contact refers to transmission via inanimate objects such as bed linens, bedpans, drinking glasses, or eating utensils. Vectors are flies, mosquitoes, or other insects capable of harboring and spreading the infectious agent. Patient Care. Major goals in the care of patients with threatening, suspected, or diagnosed infectious disease include the following: (1) prevent the spread of infection, (2) provide physiologic support to enhance the patient's natural curative powers and resources for warding off or recovering from an infection, (3) provide psychologic support, and (4) prepare the patient for self-care if this is feasible. Special precautions for prevention of the spread of infection can vary from strict isolation of the patient and such measures as wearing gloves, mask, or gown to simply using care when handling infective material. No matter what the diagnosis or status of the patient, handwashing before and after each contact is imperative. 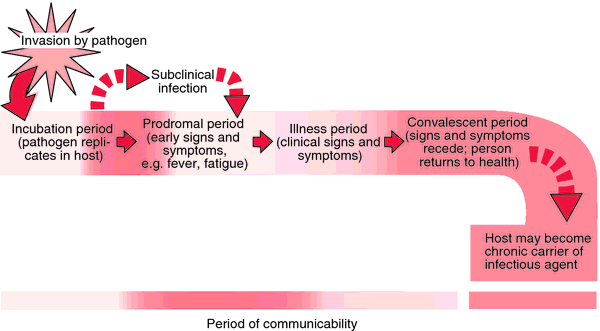 Unrecognized or subclinical infections pose a threat because many infectious agents can be transmitted when symptoms are either mild or totally absent. In the care of patients for whom special precautions have not been assigned, gloves are indicated whenever there is direct contact with blood, wound or lesion drainage, urine, stool, or oral secretions. Gowns are worn over the clothing whenever there is copious drainage and the possibility that one's clothes could become soiled with infective material. When a definitive diagnosis of an infectious disease has been made and special precautions are ordered, it is imperative that everyone having contact with the patient adhere to the rules. Family members and visitors will need instruction in the proper techniques and the reason they are necessary. Physiologic support entails bolstering the patient's external and internal defense mechanisms. Integrity of the skin is preserved. Daily bathing is avoided if it dries the skin and predisposes it to irritation and cracking. Gentle washing and thorough drying are necessary in areas where two skin surfaces touch, for example, in the groin and genital area, under heavy breasts, and in the axillae. Lotions and emollients are used not only to keep the skin soft but also to stimulate circulation. Measures are taken to prevent pressure ulcers from prolonged pressure and ischemia. Mouth care is given on a systematic basis to assure a healthy oral mucosa. The total fluid intake should not be less than 2000 ml every 24 hours. Cellular dehydration can work against adequate transport of nutrients and elimination of wastes. Maintenance of an acid urine is important when urinary tract infections are likely as when the patient is immobilized or has an indwelling urinary catheter. This can be accomplished by administering vitamin C daily. Nutritional needs are met by whatever means necessary, and may require supplemental oral feedings or total parenteral nutrition. The patient will also need adequate rest and freedom from discomfort. This may necessitate teaching her or him relaxation techniques, planning for periods of uninterrupted rest, and proper use of noninvasive comfort measures, as well as judicious use of analgesic drugs. Having an infectious disease can alter patients' self-image, making them feel self-conscious about the stigma of being infectious or “dirty,” or making them feel guilty about the danger they could pose to others. Social isolation and loneliness are also potential problems for the patient with an infectious disease. Patients also can become discouraged because some infections tend to recur or to involve other parts of the body if they are not effectively eradicated. It is important that they know about the nature of their illness, the purposes and results of diagnostic tests, and the expected effect of medications and treatments. Patient education should also include information about the ways in which a particular infection can be transmitted, proper handwashing techniques, approved disinfectants to use at home, methods for handling and disposing of contaminated articles, and any other special precautions that are indicated. If patients are to continue taking antibacterials at home, they are cautioned not to stop taking any prescribed medication even if symptoms abate and they feel better. Stages of infection. Each period varies with different pathogens and different diseases. airborne infection infection by inhalation of organisms suspended in air on water droplets or dust particles. 1. in the nursing interventions classification, a nursing intervention defined as minimizing the acquisition and transmission of infectious agents. 2. the use of surveillance, investigation, and compilation of statistical data in order to reduce the spread of infection, particularly nosocomial infections. Practitioners in infection control are often nurses employed by hospitals. They have titles such as Infection Control Officer and Infection Control Nurse, and they function as liaisons between staff nurses, physicians, department heads, the infection control committee, and the local health department. Such practitioners also assume some responsibility for teaching patients and their families, as well as employees of the hospital. The centers for disease control and prevention is an excellent source of information related to infection control; their web site is http://www.cdc.gov. Another source of help and support for infection control practitioners is the Association for Practitioners in Infection Control and Epidemiology, 1275 K St., NW, Suite 100, Washington, DC 20005-4006.
cross infection infection transmitted between patients infected with different pathogenic microorganisms. droplet infection infection due to inhalation of respiratory pathogens suspended on liquid particles exhaled by someone already infected. dustborne infection infection by inhalation of pathogens that have become affixed to particles of dust. endogenous infection that due to reactivation of organisms present in a dormant focus, as occurs, for example, in tuberculosis. exogenous infection that caused by organisms not normally present in the body but which have gained entrance from the environment. mixed infection infection with more than one kind of organism at the same time. nosocomial infection see nosocomial infection. opportunistic infection infection by an organism that does not ordinarily cause disease but becomes pathogenic under certain circumstances, as when the patient is immunocompromised. pyogenic infection infection by pus-producing organisms, most commonly species of Staphylococcus or Streptococcus. risk for infection a nursing diagnosis accepted by the North American Nursing Diagnosis Association, defined as a state in which an individual is at increased risk for being invaded by pathogenic organisms. secondary infection infection by a pathogen following an infection by a pathogen of another kind. subclinical infection infection associated with no detectable symptoms but caused by microorganisms capable of producing easily recognizable diseases, such as poliomyelitis or mumps; this may occur in an early stage of the infection, with signs and symptoms appearing later during the course of the infection, or the symptoms and signs may never appear. It is detected by the production of antibody, or by delayed hypersensitivity exhibited in a skin test reaction to such antigens as tuberculoprotein. terminal infection an acute infection occurring near the end of a disease and often causing death. urinary tract infection see urinary tract infection. vector-borne infection infection caused by microorganisms transmitted from one host to another by a carrier, such as a mosquito, louse, fly, or tick. waterborne infection infection by microorganisms transmitted in water. class of infections transmitted by an insect or animal vector. The vector may merely be a passive carrier of the infectious agent, but many kinds of infectious agents undergo a stage in biologic development in the vector, that is, the vector, as well as the human host, is essential to the survival of the infectious agent. Class of infections transmitted by an insect or animal vector. The vector may merely be a passive carrier of the infectious agent, but many kinds of infectious agents undergo a stage in biologic development in the vector, so that the vector and the human host are both essential to the survival of the infectious agent. During almost 20 years as Director of the Centers for Disease Control and Prevention's Division of Vector-Borne Infections Diseases, he was instrumental in building the division into a key centre for research into arthropod-borne infections, such as encephalitis viruses, yellow fever, and bubonic plague. Depending on the geographic location, Burchfield's vibrating canopy could play host to yellow fever, Rift Valley fever, Lyme disease, tularemia, malaria, typhus, Rocky Mountain spotted fever, to name only a few vector-borne infections that can begin with a summer buzz. Vector-borne infections (VBI) were first described in 1877 when lymphatic filariasis was found to be transmitted by mosquitoes from human to human (1).